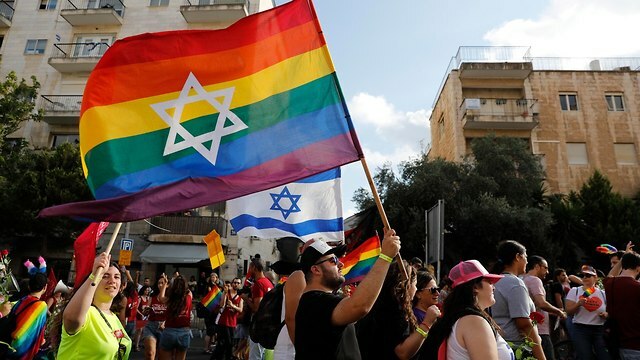 Israel saw a significant increase in the number of homophobia cases in 2018, up 54% from a year earlier, according to a new report from an LBGT watchdog. According to the report from the Nir Katz Center in Tel Aviv, there were 1,577 cases of homophobia in Israel in 2018, but in only 3% of cases a complaint was filed with the police. The data shows that 25% of the incidents took place in public areas, 22% on social networks and 15% by family members. In addition, reportedly 13% of the homophobic incidents occurred at the complainant's workplace, while 8% of cases were described as homophobic comments from government officials such as Rabbis and Knesset members. Seven percent of the discriminatory incidents were noted in the education system and higher education institutions, 5% in the defense institution, and 5% of the racist incidents were to take place in government buildings. Thirty-six percent of the complainers were gay and bisexual men, 20% lesbian and bisexual women and 14% transgender men and women. The sexual preference of 30% of the complainants is unknown. The report also shows that the number of lesbian and bisexual women who reported a homophobic incident has doubled compared to 2017. Forty-nine percent of complainers live in the middle of the country, 24% live in Jerusalem and surroundings, 14% in Haifa and the north of the country, and 13% in Be & # 39; there are Sheva and the south. Cities with the largest number of homophobic incidents reported in 2018 were Tel Aviv, Jerusalem, Haifa, Be & # 39; there are Sheva, Rishon LeZion, Holon and Ashkelon. In 2018, deputy mayor Yoel Yeshurun ​​of Holon, also the dean of the Ashkelon Academic College, published homophobic messages on his Facebook page, condemned the annual Gay Pride Parade and called members of the LGBT community & samples. # 39; and & # 39; two legged people & # 39; toe. animals. " In response, the members of the LGBT community formed a protest for the Holon town hall. Furthermore, about 180 young people have left their home in the past year after becoming the victim of homophobia. Seventy-five percent of the homophobic incidents in the defense institution allegedly took place in the army. Among the reported incidents was a soldier who was thrown out in front of her platoon and troops who tore up proud parade postcards on the desk of a homosexual soldier. In addition, soldiers who are members of the LGBT community reported that they were denied promotion and sexual harassment. The army would not have addressed the public humiliation of homosexual soldiers. Seventy-eight percent of the homophobic incidents in the education system took place in secondary schools and 20% in higher education institutions. Approximately 28% of the discriminatory acts would be carried out by clients, teachers and staff from the Ministry of Education who place homophobic content on their own Facebook pages. The homophobic incidents reported in the education system included kindergarten teachers who refused to give lessons in the LGBT community, despite the fact that some of the parents were lesbians, causing the children to be bullied daily. In addition, teachers were reported to have abused a PR team attending their school to teach about the LGBT community, while a transgender was discriminated against in the dormitory of an Israeli university. It was also reported that on average every four minutes a homophobic post on social media is published, with half of the messages targeted at homosexual men, 24% is directed against transgender men and women, 3% against lesbians and 23% is against the general LGBT community. Sixty-nine percent of those who published hateful messages were men. Chen Arieli, chairman of the Association for LGBTQ equality in Israel, stressed that the main problem is "the need to raise awareness about the need to report." The number of reported incidents has increased, but it is still a drop in the ocean compared to the actual number of events Only by raising awareness and by professionally dealing with incidents can we improve our society. " "The inciters and those who spread hatred while holding a position of power should be removed from that position, we will continue to fight for a better future and for changing the policies that make up the current reality." We will not be out of the public sphere. erased, protect our personal space and safety and continue to work tirelessly to promote equality, "she said. This is the sixth report of its kind, and the first was presented to President Reuven Rivlin.